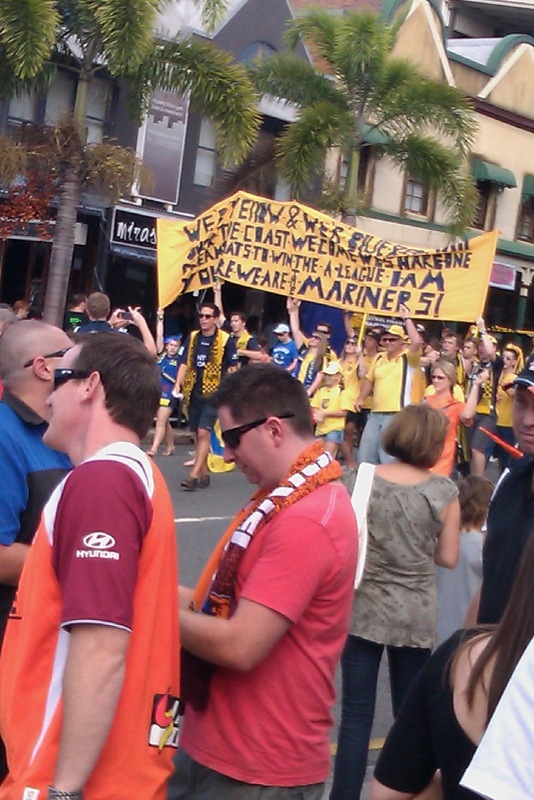 Football is probably the fourth biggest sport in Brisbane, at a professional level anyway. 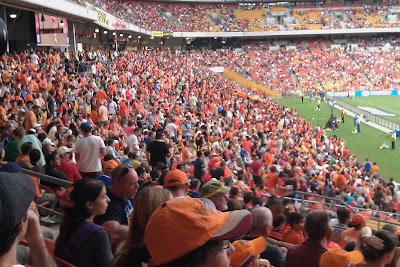 The Lions (Aussie rules), Broncos (rugby league) and Reds (Rugby Union) all have bigger crowds, more members and a LOT more media coverage than The Brisbane Roar. Two days before the Roar hosted the A league grand final the local paper produced a four page pull out section on the game. In the same issue they had 10 pages on the rugby league season starting. Nuff said. Before we get to the pub game a little background. The A-league has been around for 6 years. It was formed to replace the old NSL which had slowly been destroyed by mismanagement, tribal fighting and apathy. If you think of, say transporting any European conflict 15,000 miles and putting a football shirt on it and adding 1970’s style English hooliganism, well that was pretty much the state of play. The FFA decided to scrap it, get rid of the old stuffed shirts, tribal hate and lack of coverage and start again. The league started brilliantly, better crowds, better stadiums, full TV coverage and even Dwight Yorke. Then problems set in. Two clubs have folded and most of the rest are running at a loss. On the plus side the standard of football has improved no end and there is no better example of that than the Brisbane Roar. They were heading into the final on the back of a 27 match unbeaten run and hadn’t lost at home in over a year. Since appointing Ange Postecoglou as coach in October 2009 the club had been transformed from a team of ageing players and kids into a fast, youthful, skilful unit that plays a very attractive brand of attacking, passing football. Their opponents on the big day, Central coast Mariners, managed by former Australian coach Graham Arnold are equally adept at good football and the stage was set for a great season finale. No one was to know just how great a game it was to be. I arrived in Brisbane two and a half hours before kick-off. Immediately I sensed that this would be like no other Roar match. Just walking through King George square in the heart of the city there was a hair raising atmosphere. 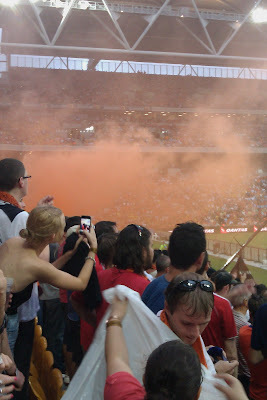 Usually going to a Roar match is like entering an “adult store”. The people that do it seem to scuttle about their business hoping that they don’t meet anyone they know. An average of just over 9,000 attended home matches this season. This time the square was a mass of Orange clad, flag waving, chanting fans. I made my way along Roma Street toward the stadium and for the first time in a long while actually felt like I was going to a football match (well apart from Norwich v Boro at Carrow Road in October). A quick refreshment stop at The Transcontinental Hotel on George street, yet another sea of Orange, and I was fortified enough to head up the hill to the stadium. Lang Park, the original unsponsored name for Suncorp Stadium, is situated in the inner city suburb of Milton. Home of the famous XXXX brewery. It’s built on the site of an old graveyard; nick named “The Cauldron” has a great history behind it and is the best rectangle stadium in Australia. Caxton Street, which runs beside the ground, is home to 4 pubs, several take-aways and one of Queensland best seafood restaurants. As I turned into the street every single one of them was full. 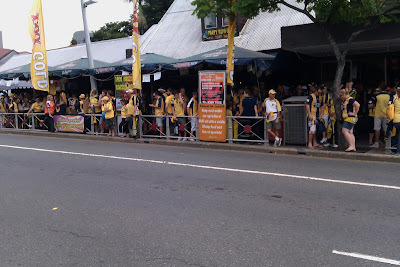 The Caxton, a massive pub which is a Brisbane Icon had become home for the bulk of the 2000 travelling Mariners fans. The banter and singing between the two sets of fans really brought a smile to my face, as did the incredibly small police presence and a wonderful ‘football stand’ that someone had constructed in their front garden. I decided to give the Caxton a miss and head off to The Paddo, another massive pub higher up the hill. At this point I decided that, with a bit of foresight, I could have made a killing by hording Orange balloons and t shirts earlier in the month. The Paddo was unsurprisingly, heaving. The barmaids, wearing cowboy hats for reasons I can’t explain, were friendly under the relentless orange tide. And a couple of beers helped to further lift the sense of anticipation. One thing I did notice, as is customary at any football match in Australia, was the number of English club shirts about. Most popular were Chelsea, Liverpool and Celtic but Southampton, Huddersfield and Brighton were all represented. Purely in the interests of adding colour to this piece I returned to the Caxton. Well more accurately the Caxton’s car park, for a last one before heading to the ground. A very wise move see’s the pub put temporary bars in the car park thus increasing their selling space, it was packed solid. Shortly after I arrived the Mariners fans departed for the stadium. About 200 people massed behind a large banner walked down the hill to the ground chanting in full voice. I felt, as Sherlock Holmes would say, that the game was a foot. If anyone needed reminding that Suncorp Stadium is the home of Queensland rugby league then the state of origin walk of fame and the statue of Wally “The King” Lewis, a rugby league legend, outside the ground reinforce the point. 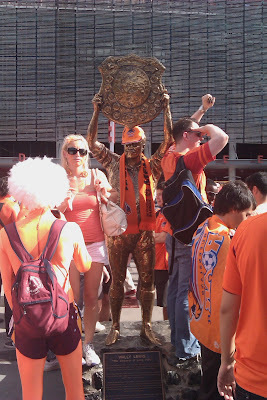 The only thing was “The King” had changed his colours and was adorned in the mandatory orange. During the January floods he was pictured in snorkel and water wings, likes to get dressed for the occasion does Wally. For a stadium absorbing 50,000 people getting into the ground was a very quick operation. As was find my seat in the home supporters area known as The Den. This is, as they say, where the action is. Taking my seat just in time to see Brisbane band Regurgitator *play a blistering set and with a beer safely out of harm’s way I was ready to be entertained. And entertained I was about to be. *Regurgitator once recorded an album whilst living in a clear Perspex dome in the centre of Melbourne. Just thought I’d mention that. The game kicked off in glorious sunshine. Both sets of fans were in full voice and the sound was amazing as it reverberated around the ground. The first half was pretty even with both sides playing a flowing passing game. Referee Matthew Breeze seemed to have left his cards in the dressing room as some rather robust challenges went without punishment. The rain started at half time meaning I now had moist sunburn. After the break the football went up a notch. The Roar pushed forward looking for the opening goal, with Mariners 18 year old keeper Matt Ryan forced to pull off a number of top class saves. It seemed inevitable that the home team would make the break through but all the slide rule passes in the world wouldn’t have made it happen. 90 minutes gone, the noise not abating for a moment, time for a deep breath and extra time.. 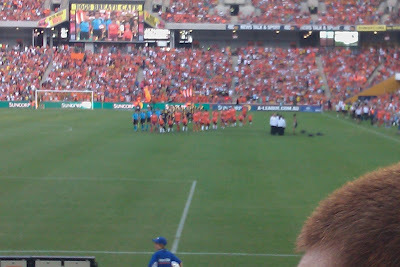 The teams trotted out to a cacophony of noise - which actually blurred the image. Blink. Once more the crowd took the noise level higher, once more the Roar players pushed forward and then, after 6 minutes a deathly silence fell over the ground. Adam Kwasnik was the only one to make any sense of a Mariners corner and calmly netted past Roar keeper Michael Theoklitos. The Roar had come back from 2 down against the same team in the Major semi-final, so no problem... Except that there was only 24 minutes to play and, unlike that match, the Mariners could shut up shop if they wanted and defend the lead. The Roar came back, throwing themselves forward looking for parity. Captain Matt McKay forced another save from Ryan before Oliver Bozanic scored from close range to seemingly take the trophy to Gosford. The whistle went for half time. The Roar were locked in a huddle in the middle of the pitch, later it transpired that Matt McKay was offering up a some inspiration words. If only some of the crowd could have shared in them as the faint hearted headed for the exits. The final 15 minutes got under way. The Roar pushed forward, Ryan made saves. There was a pattern forming here and it seemed that it was all over. The greatest unbeaten run in the history of Australian football was over and 48,000 people would leave the ground disappointed. Back in the early 90’s I was persuaded by our designated driver to leave a league cup tie at Maine Road between Manchester City and Norwich. Norwich were 3-0 down at the time and there was about two minutes to go. During that 2 minutes Robert Fleck scored for City and I took a vow NEVER to leave a match early again. Wet Tuesday nights watch Tooting from the Bog End as they lost again, Cold journeys to the arse end of nowhere watching Norwich fail to live up to expectations. No matter how desperate the situation. I don’t leave early. unleashed at that moment will bring a smile to the face of most of the people in that stadium for years to come. And for two minutes the joy reigned free. Then penalties. Penalties are no way to win a title. It’s cruel, it’s random it’s not really a reflection on footballing skill. It’s just evil. But to the winner it is priceless. Instant heroes and villains are created. Reputations made. Just under two years ago Michael Theoklitos indirectly changed the fortunes of Norwich City when he let 7 goals in against Colchester United. This led to Bryan Gunn being sacked and Paul Lambert coming in and leading them to challenge for premiership promotion, making me very happy. In this penalty shoot out he was to make me smile again. He was in the face of the Mariners players as they made their way to the spot, was hyperactive on his line and then made two top notch saves to bring the trophy home to Brisbane. I’m not really a people person. Grumpy is the word my eldest daughter uses to describe me (when she’s feeling generous) but I hugged strangers, shed a tear and helped raise the roof when Henrique slotted in the winning penalty. 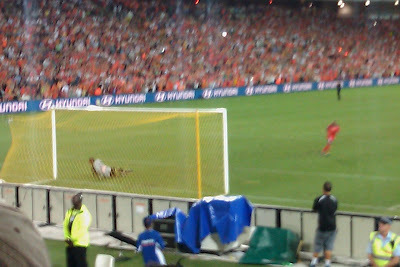 Henrique slots home the winning penalty. Bedlam ensues. 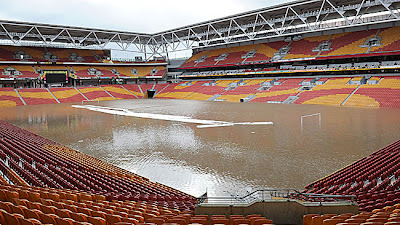 As a venue for football the Suncorp stadium is amongst the best I’ve visited, and that includes stadiums in England, Scotland, Wales, Spain and New Zealand. Great views all around the ground. A really good location with plenty of good pubs near by. The standard of Australian football is improving, with teams like the Roar and the Mariners leading the way. More matches like this will help but people have to attend to save football down under. The next challenge for the Roar is to find new investors, the club is being run by Football Federation Australia, and retain Ange Postecoglou, with Melbourne Victory having sacked their coach two days before the final and prowling around waving money at Ange, this has to be the most important move if the Roar at to capitalise on the interest and good feeling created by this incredible season. Next year the Roar will be in the Asian champions league. If they can keep the manager and team they have at the moment then they should do well, and I’m looking forward to an Asian away day. **dedicated to my father in law, Joe Henry, who left the ground with five minutes of extra time remaining. Oops. Excellent article, excellent game. a sterling advertisement for the game in australia......now its up to the people to show up and raise the game to the next level.